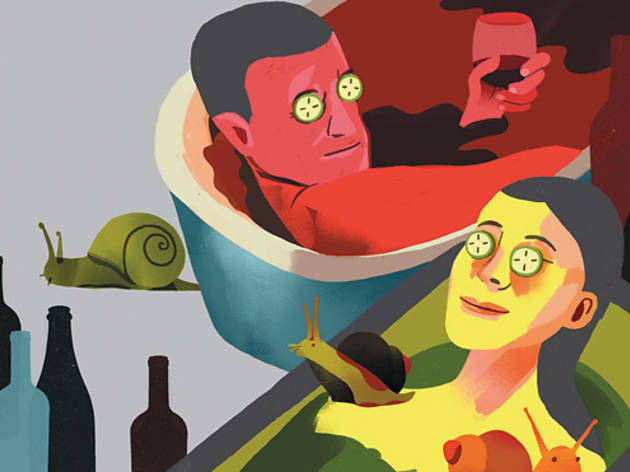 What’s the craziest spa treatment you’ve ever heard of? That’s probably nothing compared to these bizarre services from around the world. You’re probably used to your favorite mixologist asking if you want your tequila with or without salt, lime or lemon, etc. But if you’re vacationing in Mexico and opt for a little R&R at the spa, be prepared for the aesthetician to ask if you’d like a side of cactus with your tequila body scrub. This super exfoliating body treatment (clients are massaged with loofah-like cactus pads) aims to rid your skin of most impurities. Maybe body shots are good for you? Try instead NoMI’s seasonal body polish ($120), a sweet cream sea-salt scrub for exfoliating, paired with a strawberry moisturizer that contains vitamins A, B and C.
Not only does Pepto-Bismol provide relief for an upset stomach, but it’s also said to serve as a healing mechanism for adult acne. The active ingredient, subsalicylate (comparable to salicylic acid) treats and prevents future breakouts for acne sufferers. As far as we can tell, it’s not available in any spas, but it was featured on the Dr. Oz show. Instead try Ruby Room’s Deep Cleanse facial ($120), which incorporates a double exfoliation and Arcona products (some of which contain salicylic acid) to nourish and revitalize the skin’s surface. 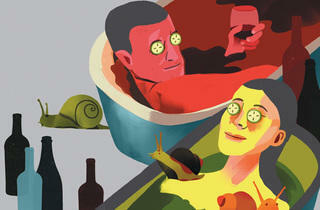 We always assumed the best vino came in a bottle, not a bathtub. But it appears that a spa day in Germany includes soaking in a tub filled with red wine (minus the cheese and crackers). The treatment is supposed to reduce the appearance of cellulite and leave your skin feeling soft. Instead try The Spa at theWit offers a variety of baths. We like the Rehab Me ($35), a salt bath of peppermint, spearmint and eucalyptus to relieve muscle tension.